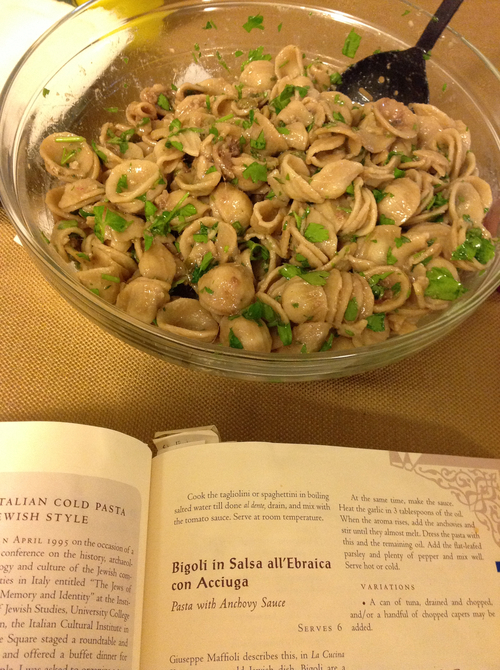 This recipe is derived from Bigoli in Salsa all'Ebraica con Acciuga from The Book of Jewish Food by Claudia Rodin. I cut back on the anchovies (by half), but it's still a lot of anchovies for non-Italians. I usually forget or skip the pepper. I have never chopped the capers as instructed in the original recipe; maybe capers are bigger in Italy. Boil pasta with a dash of salt and drain. In a saucepan, heat garlic in oil just until the aroma rises. Add anchovies with their oil and stir until they dissolve a bit. Freshen pasta and mix with the sauce in a large bowl (or in the sauce pan, if it's large enough). Add parsley, pepper, and capers. Serve hot or cold.